Quickie travel update: On Monday we stopped in Denver at the Denver Children's Museum. 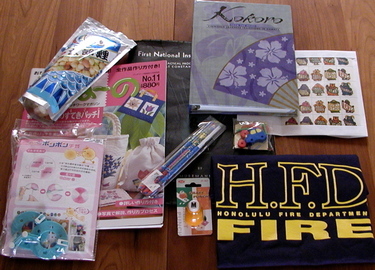 The highlight of this was the real firetruck there. 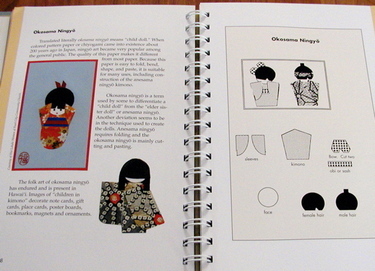 They even had little uniforms the kids could put on. It was quite a hit with all the kids. In Nebraska, we stopped in Aurora at the Edgerton Explorit Center. Turns out that Doc Edgerton (of strobe photography fame, recall the milk drop splash photo) was from Aurora, so they have a museum here, with a strobe alley and lots of other exploratorium hands-on things for kids. We stayed there 3 hours! Max had a great time. On Tuesday we got an early start and made it to Des Moines, Iowa. We stayed at a hotel (and have been since) because my neck is acting up. Our "fun" stop for Tuesday was the Putnam Museum in Davenport, IA. It's a natural history museum, with a "discovery" (play) room that Max loved. It had a pioneer kitchen, and for whatever reason it was impossible to pull him away from that. 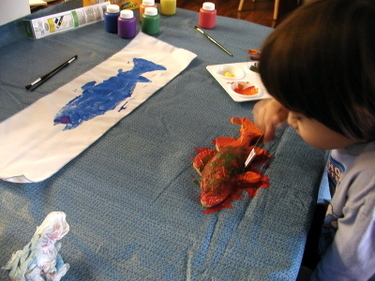 Aquarium Moment by Katie Vaclavik. 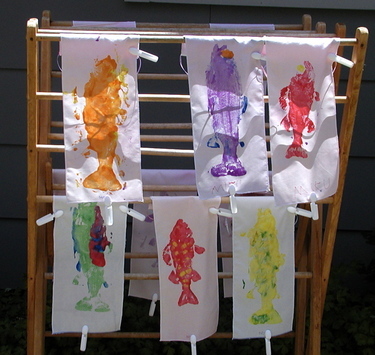 She fussy cut the fish in this log cabin quilt, they look like they're peeking out of various hidey-holes. The Pair by Colleen Curry. 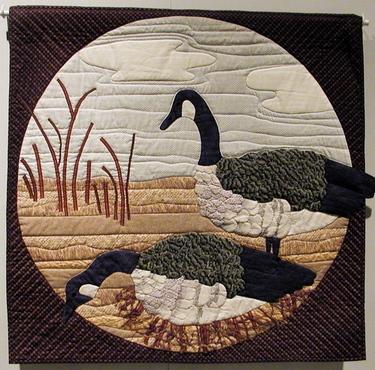 I like how the top goose's tail "engages the edge". 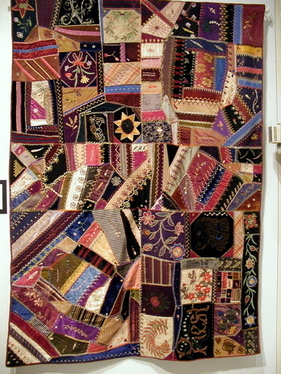 Crazy Quilt by unknown. 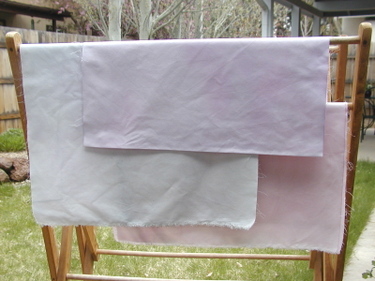 The sign said that these "were not made as bedcovers, but were used in the parlor so visitors could see how skilled the women of the house were with their needles and paintbrushes." 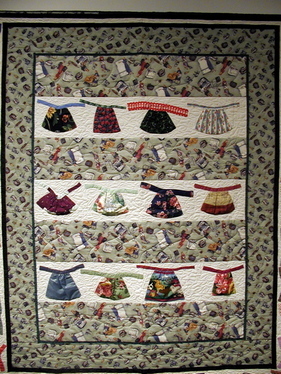 Dedicated to Domestic Goddesses Everywhere by Judy Helms. This seemed like a great variation on the Tie One On monthly apron theme! Tribute to Neola Baker by Rosalie Baker. This isn't the type of quilt I would make myself, but I was amazed by the skill and love evident here. 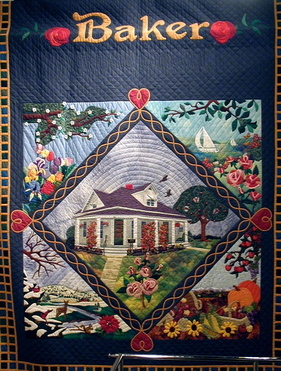 Rosalie Baker made this quilt for her husband on their 25th wedding anniversary, as a tribute to his mother, her mother-in-law. 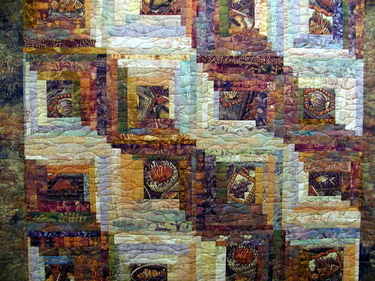 I have more quilt pictures, but that'll probably do for now. And tonight we're in Youngstown, Ohio. We're within 400 mi. of NYC, so we should reach there (our first destination) sometime tomorrow. It sure will be good to not be driving every day. 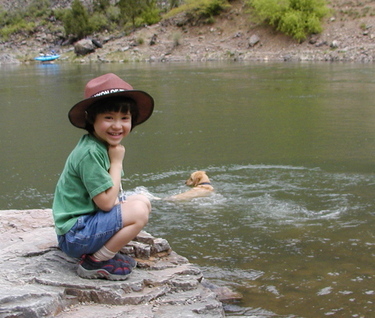 After leaving Black Canyon, we drove north on a scenic highway to Glenwood Springs. Scenic here means winding, and after an hour of this I was so nauseous that we had to stop so I could to drive (I'm sure that the excess of potato chips had nothing to do with my condition). We then had problems locating the campgrounds shown on our map, so we drove east a bit to Eagle and are staying at a Holiday Inn (with free internet). On Friday we drove about 300 miles in 6 hours. On Saturday we drove about 350 miles in 12 hours. Granted we stopped a few times on Saturday, and weren't on the major interstates. But so far we've mostly been driving north, and making little headway in the easterly direction. So today my goal is to get out of Colorado, as nice a state as it is. After a stop at the Denver Children's Museum. We've finally reached I-70, so we should be able to drive faster today. As part of our trip prep, I photocopied a big map of the US and taped it together. On it, we've circled home and our destinations (NY, Boston). And each day we're tracing our route in a different color of crayon so Max can see where we're going. At first he didn't understand why we weren't getting to grandma's house that day. He sort of understands now, but still keeps asking us if we'll be there today. One more anecdote: After waking up Saturday morning at Mesa Verde, Steve noticed that one of our tires was low and found the nail that was embedded in it. So we put on the spare, tucked the low tire back in our car, ....and piled all of our luggage back on top of it. Since we'd need to get it out soon, we tried to put the smaller things up in the rooftop box, to make it easier to extricate the tire once we were in town. Since we're new to the rooftop box, we have to remember that our clearance is higher now, and not to drive into garages etc. My comment: "Honey, please be careful and don't knock the Yakima off the top of the car, my knitting is in there." The thought of my knitting bouncing down the highway (never mind our clothes, the tent, etc.) was particularly disturbing. Not that there would be something on the highway that's only 8 feet tall that we would need to drive under; logic was not a part of this. p.s. Happy Mother's Day to all moms out there! 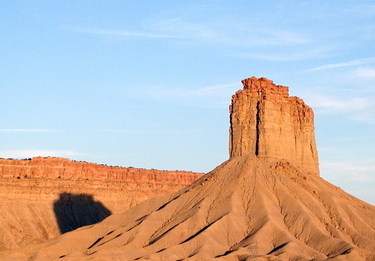 Tomorrow we'll be piling into our car and heading east for an extended vacation (1 month!) on the east coast. We'll be visiting both grandparents, in NYC and Boston. We're planning to camp along the way. If anyone has suggestions for things to bring that keep your 4-year-old child occupied during the endless miles, please let me know, as this will be our first time. I know I'm asking that question a little late in the game, but since I haven't packed yet I figure it's still valid. Yesterday I had my 2nd violin recital. I played Bach's Minuet 2. This was quite a different type of piece for me, since in my first recital I played Twinkle with the peanut-butter-jelly-sandwich variation. I thought I was doing fine, not nervous, but I discovered that I was just repressing the nervousness. Unfortunately I didn't discover this until just before the recital, when it was too late to do anything. So my bow was incredibly jumpy the whole time because I couldn't calm the shakiness in my arm (this may have helped with the string crossing on this piece), and I was completely unable to remember the specific notes for two very simple passages, so I just let the pianist take those. Ugh. It's very frustrating, because I can play that piece so much better, but just getting up in front of a crowd sends me to pieces. Well, at least it's over and I did it. In case you're interested, Greta's nest as well as Greta herself were done freehand. 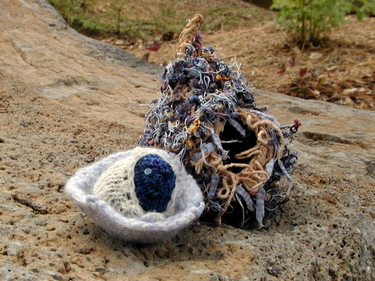 The nest shape started back in April when I had an idea for knitted Easter eggs. Along the way to trying to get a good egg shape, I happened upon this teardrop shape and thought it looked like a nest. Greta was constructed after about 5 attempts. The first one ended up looking like the head of a turkey vulture; while a bird, it wasn't the look I was going for. The nest was made from cotton twine; after construction I tea-dyed it a brown shade and starched it. All around the nest I tucked in various flag/nub/novelty yarns: Filatura di Crosa's Ananas in a colorway of reds, Stacy Charles' Fiero in multi-colors dominated by blues, and Crystal Palace's wonderful Light Pipe in light blues. Her inner nest was made from Dolcetto, a recent JoAnn's find, a wool-cotton blend that felts nicely. I also knit some of the light pipe into the inner nest. Greta herself was made from some Koigu handpaint that I had left over after knitting a pair of socks for my hubby. And her shawl was made from some lovely and local alpaca that I've been hoarding for some time now. After knitting this random shape for a bird nest, I went to the library to do some research and see if any birds actually make such a thing. I found two possibilities, the verdin (Auriparus flaviceps) and the bushtit (Psaltriparus minimus). I think the verdin's looked closer, and here's what they said about the nest: "Oval-shaped ball of interlaced thorny twigs, firmly constructed. Entrance near bottom, leads to an interior cup made of grasses, leaves, and an abundance of feathers all bound together with spider silk. Nests endure year after year." After I read this I decided to make Greta's inner nest. The whole ensemble was very fun to make. 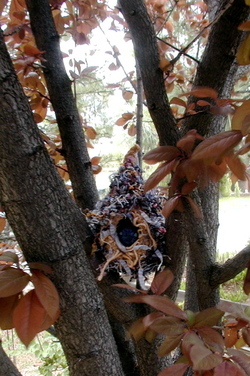 I'm doing another outer nest and will try putting it outside, I wonder if anyone will adopt it. I guess it's a little too late in the season for that though, even if some bird were inclined to. Oh, I just noticed that I forgot to put on Greta's beak! How embarassing! 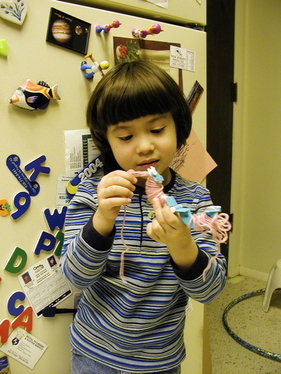 ...and my favorite, a pom-pon maker that hinges open so you don't have to feed the yarn through the center. I've been wanting one of these forever. As you can see, Max has already appropriated it, but I managed to get it back. Thank you Myra! You certainly brightened our weekend! 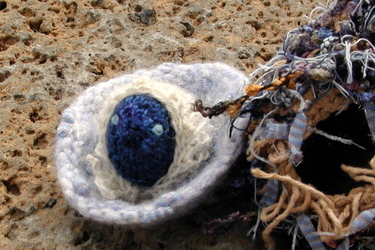 Upon closer inspection, I found that the nest was inhabited by a Greater Yarncatcher, a species of bird that makes its home near sources of fiber they can use to construct their nests (therefore they flock to knitters). Greta, the denizen of this particular nest, agreed to come out for a photo shoot (I promised her wool clippings). She has constructed a soft inner nest that looks almost felted, and somehow she has managed to make herself a lovely lace-edge shawl! Greta is quite some bird! She tells of her cousin, the Greater Quiltcatcher. I'm on the lookout and will post pictures if I find one!